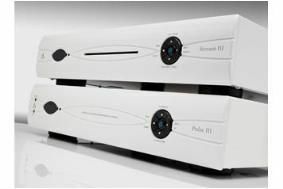 UPDATE: Leema launches Pulse III amplifier and Stream III CD player | What Hi-Fi? We first saw Leema's new Stream III and Pulse III CD player and stereo amplifier at the Bristol Show back in February. They were initally due on sale in May, as you'll read in our original story below, but have finally made it to the shops this month at a slightly higher price of £1495 each (they were originally going to be £1400). They're available in white or black gloss finishes, with solid aluminium fascias, and the CD player has an all-new slot-loading transport which is controlled by Leema's own custom firmware. The Stream III has a new Leema Quad DAC, which is a further refinement of the firm's own MD2 mulit-DAC, giving a shorter signal path and "even better performance". In common with the Pulse III, the Stream III has four digital inputs for connecting other devices. Leema's surprise new launch at the Bristol Show is the Pulse III amplifier and Stream III CD player, on sale from May at £1495 each. They replace the existing Pulse range, and Leema says it decided to call the new models Pulse III/Stream III (rather than Pulse II/Stream II) because they are such a big technical advance over the old models. They're finished in a distinctive white or black gloss, with floorstanding speakers to match. The amp is fitted with four digital inputs – two optical, one coaxial and a USB – so can be used to improve the sound of digital sources such as a Sonos music server, a Sky set-top box, or gaming/streaming devices such as a Sony PS3. Under the lid, the Pulse III amplifier uses advanced circuitry and software "to reduce noise and increase detail and resolution", says Leema. There's a front-mounted MP3 input, headphone socket and standby power is just 0.5W. As well as catering for digital sources, the Pulse III also has an MM/MC phono stage for connecting a turntable.